The same folks that created and distributed my all time favorite sim "Grand Prix Legends" are also responsible for Nascar Racing 3; Papyrus developed, Sierra published. So it's tough for me to swipe at them too hard. Nevertheless, I'll swipe where I think a swipe is needed. It shakes out thusly to me: The excellent Grand Prix Legends = labor of love, the decent Nascar Racing series = cash cow. My simple analysis is based on absolutely nothing. From where I sit this is just how it appears. I don't doubt that the Nascar Racing series began life as a labor of some ones love. But after shinning it's bumpers and reselling it as new 3 times in 2 years, I would suggest that the love has been subjugated by a lower calling. Having played Nascar 3, Nascar 99, and Nascar 2 extensively, it is impossible for me to review Nascar 3 as a new stand-alone game. At best I can only appreciate it as a very expensive patch. There were a few improvements, but that's what they were, improvements and not a new game. They added support for Force Feedback, 3D sound and native 3dfx and D3D adding higher resolutions. With that came much nicer textures for both cars and tracks. They added some more tracks. Finally they added smoke effects and skid marks that stay put once laid. That's about it. I have heard that the AI is much improved. Not. Anyone who has faced the AI of the good recent sims (Sports Car GT, Superbike 2000 etc) or the older far superior GPL AI will see that N3's AI is working with far less brain-code power. Cars still check-up for no reason and still stack up behind stopped cars instead of going around. Cars still routinely jitter about looking remarkably as if they are confused and don't know what to do. My guess is that they are confused and don't know what to do. Fortunately, when they are confused, they choose to do very little. Or maybe that is unfortunate, for yet another carry over from the earlier sims AI is predictability. I should also note that I am able to detect no change in the driving physics model whatsoever. This lack of fundamental changes and emphasis on the superficial, truly comes as no surprise since the same 16 bit software engine that drives Nascar 3 drove Nascar 99. 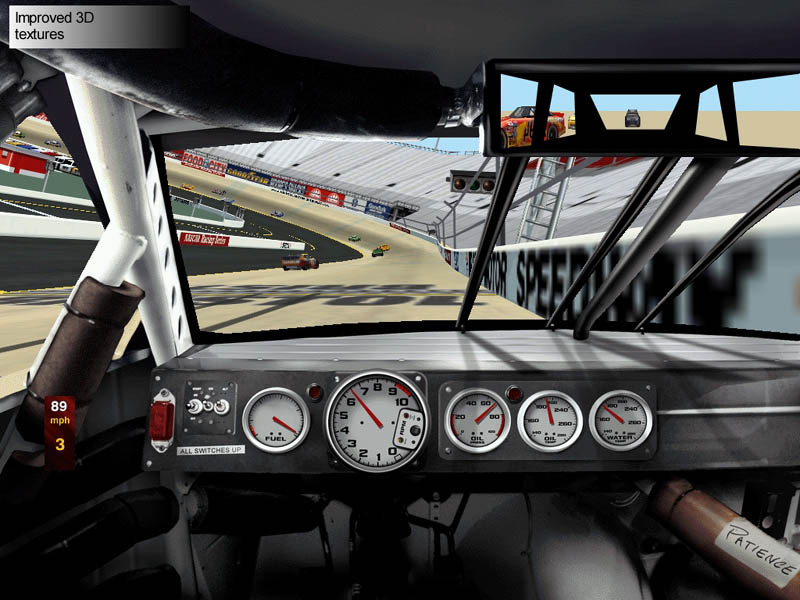 Reviewers complained that Nascar 99 wasn't enough of a new game to buy because it, in fact, had the same software engine as Nascar 2. That's right kids. 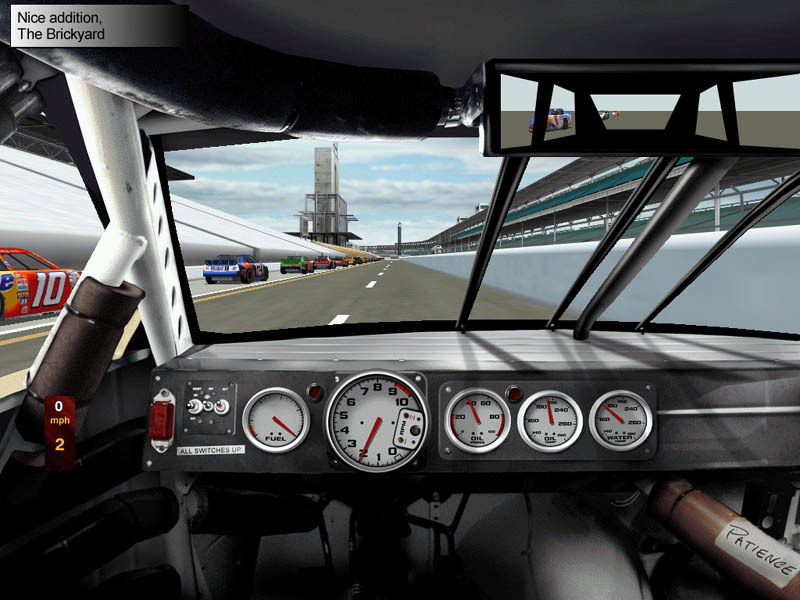 Go ya one better: same engine in Nascar Legends as well. It is becoming fairly standard in the industry to re-use engines, but most often an entirely different entity is licensing use of an engine for an entirely different project. 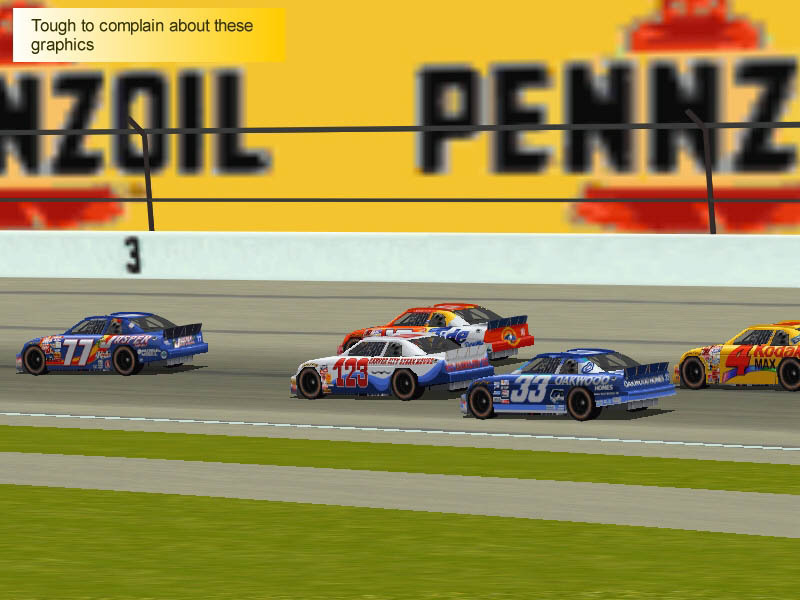 In-house re-use of an engine is hardly unheard of, but IMHO Nascar 3 should have been sold as an expansion at half the price of a full title if it was sold at all. Why they chose not to use the incredible 32bit GPL engine (as they said they would) is a mystery to me, to other reviewers and to many fans of the series. My guess is they figured to save money; after all you have to feed the cow. Enough swiping lest you think I hate this game. I don't. It was fun in the first version I played, and testament to its strength is that it is still fun now. The improvements have made it a better game. 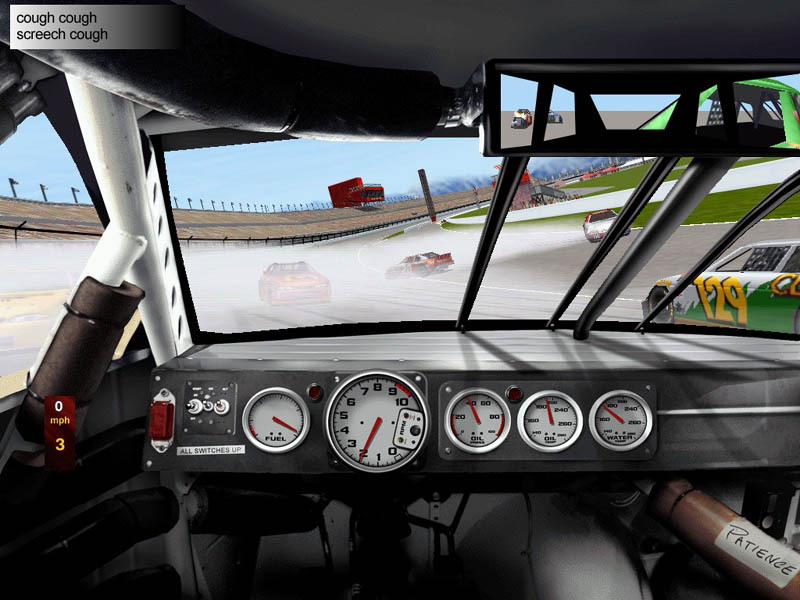 If you have never played any of the others, Nascar 3 will be fun for you especially if you are a fan of Nascar. But if you have played the others, expect little new here other than support for recent technology and a couple bells and whistles.